Hold on to your parchment cone and icing and get ready for some serious fun! 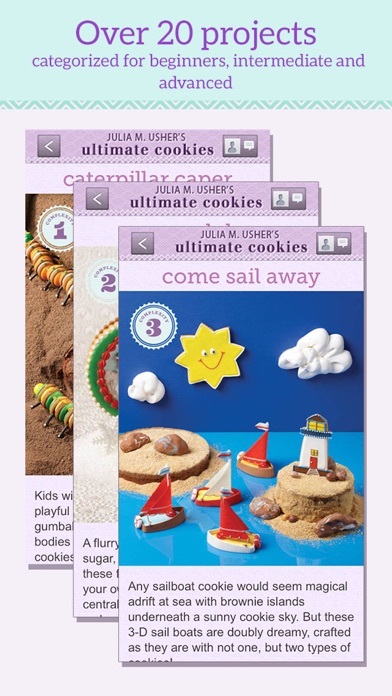 Julia M. Usher’s Ultimate Cookies puts the power of creative cookie decorating into the palm of your hand. 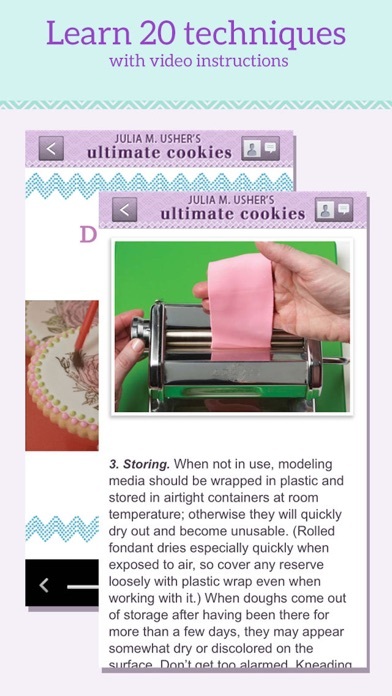 Each cookie decorating project includes referenced links to the recipe for the appropriate dough and icing used, as well as instructional videos that make you feel like Julia is in the room guiding you step by step. 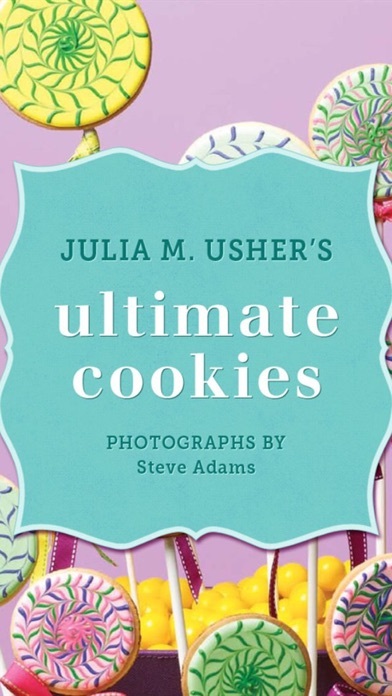 Whether you want to bake up some creative gifts for the holidays, wow your friends for a dessert party, or simply challenge your own craft and cooking skills, Julia M. Usher’s Ultimate Cookies delivers! Features include: • 20 hand-selected cookie projects from her book, Julia M. Usher’s Ultimate Cookies • 15 instructional videos, covering various decorating techniques, cross-referenced to each cookie project • Step-by-step project formats with full-color photography • Ability to sort projects by complexity and technique Julia M. Usher is a celebrated pastry chef, food writer, and food stylist whose work, both written and edible, has appeared in Vera Wang on Weddings, Bon Appétit, Fine Cooking, Better Homes and Gardens, Mary Engelbreit’s Home Companion, Gastronomica, and nearly every national bridal magazine. Julia is Contributing Editor at Dessert Professional, a 2008 James Beard Foundation Journalism Awards finalist, and President of the International Association of Culinary Professionals. 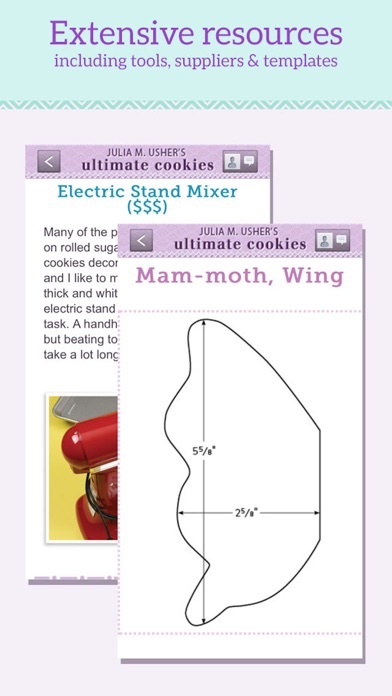 These cookies are gorgeous, and the helpful lists of tips, supplies, templates, and "prep talk" sessions make me believe I can make something that actually might come close to resembling the cookies in the pictures. I like how the projects are divided into "beginner, intermediate, and advanced." I think I'll start with the lollipop cookies. If I succeed, I may attempt the "fab bags"--adorable little purses made out of cookies--for my daughter's bday. This is the way to one-up your neighbors in the annual cookie exchange or impress your in-laws. The cookies look difficult to make but the step-by-step instructions, videos, and tips make it simple to create mind-blowing cookies. They do still take time. Great app.